Do you have a holiday party on your calendar yet? I love this time of the year, so many opportunities to enjoy family and friends. Having people over and celebrating the season is fun but can be a little overwhelming. The house has to be clean, my kids have to be clean, and I have to prepare food drinks and a table. Trying to do all this on a budget is a daunting task. 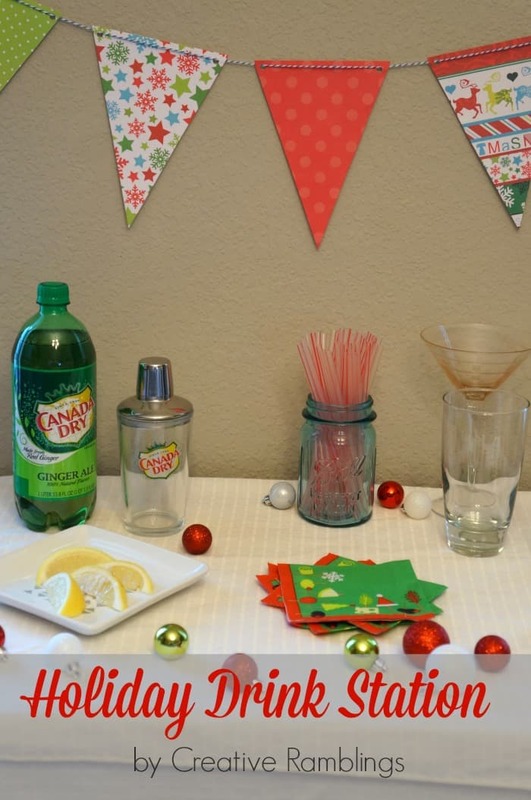 I’m sharing with you today a little drink station that I can keep up throughout the season and can replenish for each party with some great deals from Canada Dry. I set up a little table in my dining room with a white tablecloth and simple festive banner behind it. 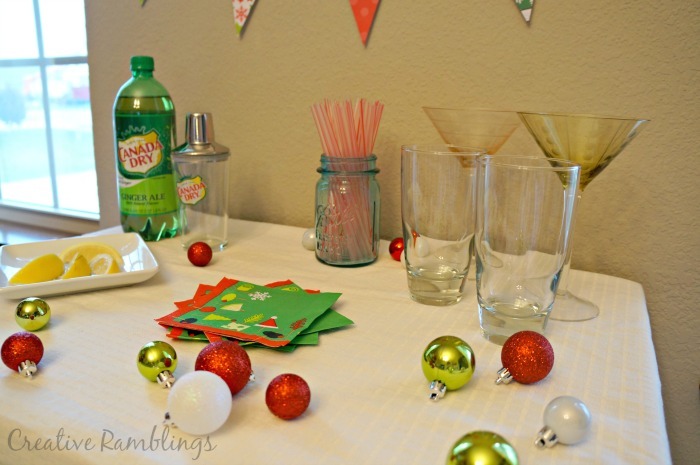 For each party I can stock my table with glasses, straws, napkins, and drink extras. With this set up, and this pretty little shaker from Canada Dry, I can make drinks to order. 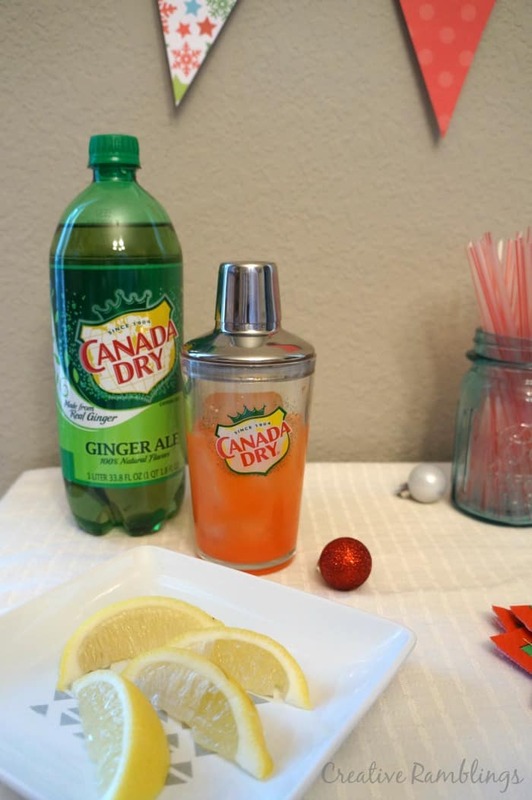 I found a delicious non alcoholic recipe from Canada Dry that may be my go-to for the season. Little Lady already loves it. It combines orange juice, lemon juice, grenadine, and Canada Dry Ginger Ale. This and other holiday drink recipes came with this cute little shaker. One less thing to worry about when prepping for your party. Want to score a shaker of your own? How about a great deal on drinks? Exclusively at Target, for a limited time, buy any three (3) Diet, Regular or TEN Canada Dry, 7UP, A&W, Sunkist or other participating products & get a FREE Canada Dry Shaker. Want to save even more? You can use Cartwheel to save an additional 5% off participating products. How do you get ready for holiday parties? I’d love your tips.